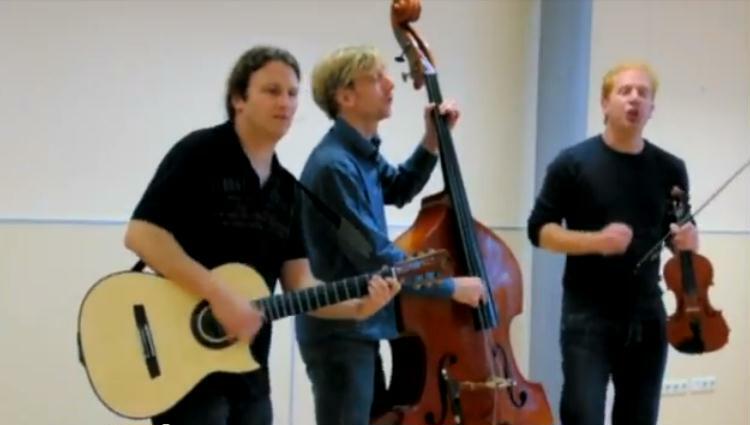 Continuing our series of introducing new musical groups, today we're focusing on a talented trio of Klezmer musicians from the Netherlands who call themselves Die Drei Dudelim. 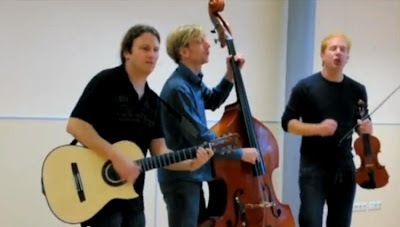 The band Die Drei Dudelim ('the three players of tunes') consists of three good friends who have been playing Klezmer music since 1994. Their music is heavily inspired by the old Eastern European Klezmer tradition, but with a modern 'feel', and it clearly reveals their classical music education. The Dudelim are multi-instrumentalists, playing several guitars, violin, clarinet, and mandolin as well as double bass, but they also distinguish themselves by their excellent vocals. The moods of their songs vary from quiet and melancholic to vibrant, fast, and full of excitement. In today's video they play a Yiddish classic, Der Rebbe Elimelech, sort of a Yiddish version of Old King Cole. Just in case you don't know this Yiddish standard, it describes an Eastern European rabbi who has a little too much to drink when Shabbat ends and becomes more and more happy and boisterous as the evening progresses. More like this would be nice!! Quite a unique musical group enjoyable to hear. Very talented musicians! Just GREAT! Thanks Al----M.A. Our three CD's 'Schpil ze mir, Klezmorimlach', 'Spiel Klezmer Spiel', and the older 'Jiddische liederen' are available on Spotify and in the iTunes store. More video's are available on youtube if you search for 'Dudelim'.